In a surprise move yesterday, Glenn Stevens and the rest of the brainiacs over at the Reserve Bank of Australia hit the markets with a rate cut, bringing down baseline rates from 3.50% to 3.25%. This marked the first time in three months that the RBA changed interest rates, bringing them one step closer to lows set in 2009. While the move was generally a surprise, it wasn’t a complete shocker. For one, a recent survey by Bloomberg economists indicated that 9 out of 28 participants predicted the rate cut. Props to you mates – maybe you should try your luck with the lottery! Ha! Furthermore, the Melbourne Institute latest inflation gauge printed at 0.2% earlier this week, down from 0.6% in August, indicating that the RBA did have room to cut interest rates in order to stimulate the economy. Based on the accompanying statement, it appears that policy makers were starting to get the willies once they saw what was happening across the world. RBA Governor Stevens pointed to modest growth in the U.S., contraction in Europe, and slowing demand from China as serious risks to the Australian economy. On the local front, Stevens did acknowledge an improving labor market and stable consumption growth during the first half of 2012, but he also remained cautious about how they would hold up. Stevens also expressed concern about the drop in commodity prices, which have fallen 10% since the peak in 2011. For these reasons, the RBA felt it was time to whip out the rate cut guns in order to give the economy some support. How did the Aussie fare? 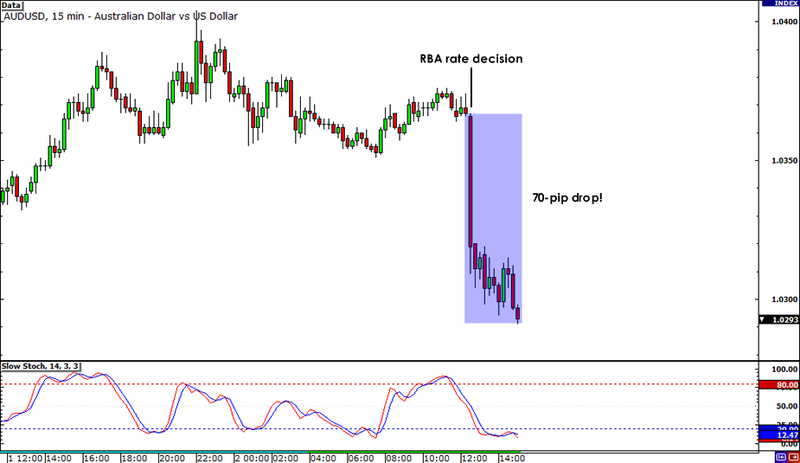 Right after the announcement, AUD/USD gapped down by a few pips before plummeting by roughly 70 pips. The pair found a bit of support around the 1.0300 mark but Aussie bears still seem to have enough energy to push AUD/USD much lower. Considering how other central banks such as the Fed, ECB, BOE, and BOJ have all resorted to further stimulus lately, it isn’t so surprising that the RBA joined the bandwagon. After all, the threat of a global economic slowdown concerns most major economies and it’s only fitting that their central banks coordinate their plans in order to spur growth. As I mentioned in one of my old articles, there is a strong case for an Aussie dollar selloff going forward based on the minutes of the previous RBA meeting. Aside from weak Chinese demand, Australia’s poor inflation outlook and the negative effect of recent AUD rallies on exports were among the reasons for an RBA rate cut. Now that the RBA has pulled the trigger, the only question left is whether or not the RBA is done cutting rates. Is the RBA done cutting interest rates?